After initially going on the offensive and stirring up controversy by accusing Sacha Baron Cohen of posing as a wounded veteran to trick her into an interview, the former governor of Alaska didn’t even end up appearing on Sunday’s episode of Who Is America? Showtime declined to comment, but a few weeks ago, Showtime CEO David Nevins had said that, “There are several people who have thrown themselves into buses that may not be heading their way.” And when asked specifically about the Palin segment, he warned that Cohen has a “high bar” and therefore he couldn’t speak to what would make it into the final product of the show. And it turns out that for all her worrying, Palin’s segment didn’t make the cut. Though, for good measure, the show did give her a credit, as their Special Publicity Consultant (Inadvertent). 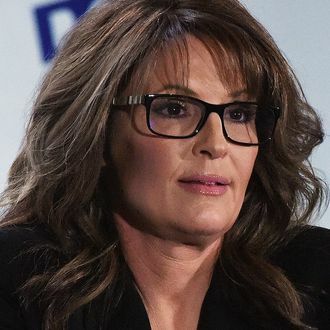 Sarah Palin Didn’t Even Make It Into Who Is America?